Comments for Puzzle Baby Quilt..
Soooo lovely... how can I get the pattern for this amazing quilt? I would love to have this pattern. I have not been able to get it from your site. Please help! How can I get the pattern for the puzzle baby quilt. Tell your husband my brother a big guy quilted and he played football for OU and later was a coach but he loved it! Is it possible that I can get the pattern for this quilt? How can I get your Puzzle Quilt pattern? After seeing it on pinterest, I so want to make this for my grandchild. I would love to have the pattern for the Puzzle Baby Quilt. Could you email it to me? I have A grandson that is autistic. puzzle pieces are the symbol for autism . I would love it if you would send me the pattern. Thank you. I'm looking for the puzzle quilt pattern, Could you possibly email it to me? Would you please email me the quilt pattern. Love this quilt! Can you email me the pattern? I just love your puzzle quilt!!! I would really appreciate it if you would email me the pattern. Im going to make both my baby's one of these beautiful quilts. Is it possible to purchase this pattern? Is it available in the book? Is this pattern available anywhere? I would love to have it. Please email puzzle quilt pattern. this pattern is amazing, with so many possible actions! A person. Old use this pattern for so many diff occasions, and young as well as older! I love it! If I leave my husbands email, would it be at all possible to receive the pattern that way? I have a grand boy who would like this very much. I love this quilt and think it would make a great gift for my Mother and Father in loves, they are so hard to buy for but if we could all share a memory on a puzzle piece I think they would love it!! Could I buy the pattern from you? I love this quilt! Can I get a copy of it? how can I get this pattern to make this really cute puzzle quilt? You should be able to download the pattern of the site directly. i was wondering how I could get a copy of this beautiful quilt. Could you please e-mail the puzzle baby quilt pattern? can I get the puzzle quilt pattern? Hi, is it possible to get the pattern for the puzzle quilt? My daughter loves it, and I would love to make it for her. Hi - my daughter loves your puzzle quilt, and so do I! She actually wants me to make it for her college dorm. I am having trouble downloading the pattern. Could you possibly email it to me? I've downloaded the DocToPDF file, but what do I click on on your web page to download the free pattern? I'm lost how to actually get the patterns, and so many pin sites seem to be using this format. Thanks. I am glad you took the time to post your quilt picture. 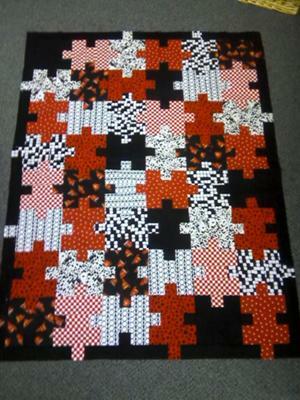 It is a great set of blocks and I encourage your hubby to start quilting soon! !